Conversation between the singer and her talk show host pal took an emotional turn during Tuesday's show. 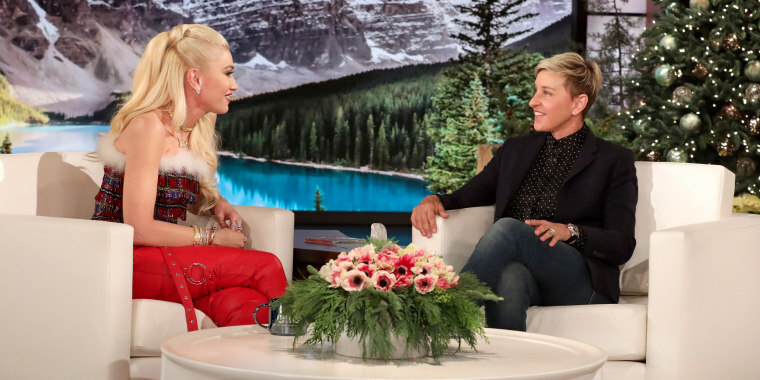 The conversation between DeGeneres and the "You Make It Feel Like Christmas" singer started out on a happy note, with Stefani bantering about boyfriend Blake Shelton (and denying DeGeneres' repeated claims that the duo are now engaged). But soon things took a teary turn — for truly tender reason. Stefani, 49, and DeGeneres, 60, have been pals for years. They're the sort of friends who talk about their creative endeavors, relationships and generally just share life's ups and downs. And for a period of time, Stefani lived through a lot downs. "I will always be so grateful for those conversations with you," she said. "Let’s get serious for a second, I mean, honestly." While neither Stefani nor DeGeneres brought up the topic of those conversations, it seemed clear they were hinting about Stefani's 2015 split then-husband Gavin Rossdale, with whom she shares three sons. "Gwen, you know, she deserves everything she has," the host told her audience. "She deserves this love; she deserves the life that she has and the career, because she went through a lot." Those kind words were all it took to get the waterworks going. "Don’t make me cry!" Stefani begged her. "I mean it," her pal insisted as she kept crying. "I love you and I hated to see what you were going through, and you didn’t deserve it. You deserve, you know, just everything. So I’m happy for you as your friend." A humble Stefani remained overwhelmed by the emotional moment, and DeGeneres continued. "That’s why I love her so much," she said. "Because (you don't) even understand how great you are."